And whether or not you’re of the era that knows “O.G.” means “original gangsta” – and that that’s a good thing – you surely know that Swindle, “The G-Man” to his fans, won Bassmaster’s 2016 Angler of the Year. 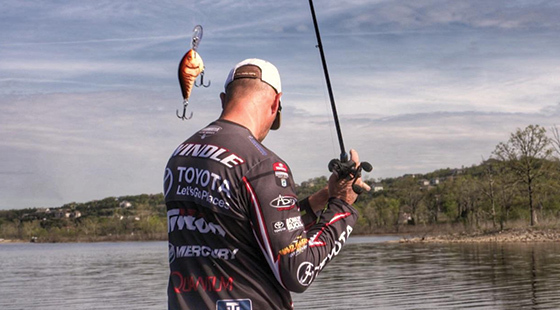 Since Swindle became what he laughingly calls a “free agent” in the hard-bait pro-team market, “Rapala was the only brand I had my eye on,” he says. “Because I want to be with a company that I already win money with, already believe in 100 percent, heart and soul. The admiration is mutual says Rapala Field Promotions Manager Dan Quinn. While Swindle is looking forward to growing his Rapala collection with newer game-changing baits like the RipStop®, Shadow Rap® and BX® Brat, he says Rapala’s classic balsa baits will always have a place in his boat. The balsa-wood bodies of Shad Raps and DT baits impart action that imitators just can’t match – especially in cold water. A proven classic, the Shad Rap is equally effective whether cast or trolled and is designed to be fished from ultra-slow to super-fast speeds with superior results. The DT series of crankbaits dive fast to a pre-set depth and stay in the strike zone longer than any other crankbait on the market. They combine carefully placed internal weights, a tapered fuselage and a thin tail to create the ultimate crankbait action. Another new name Swindle will be wearing with pride on his jersey in 2018 is hook and terminal tackle brand VMC, a Rapala Respected Brand. Since 1910 VMC has led the market in hook manufacturing and innovation. “I’ve been using these hooks for a long time, so I know a lot about them and have a lot of trust in them,” Swindle says. VMC manufactures the highest quality fish hooks, rigs, jigs and terminal tackle in the industry. It creates award-winning products for every style of fishing, many with first-to-market features. With two centuries of experience, the innovative craftsmanship of VMC design shows in every product. This entry was posted in Pro Staff, Rapala and tagged DT, Rapala, Shad Rap, VMC. Bookmark the permalink. Does anybody proof read and use spell check anymore? Definitely getting Swindle on-board is a winning move for all concerned!